We had a slow day today and did not go anywhere. Except to the waterfront for an afternoon walk. 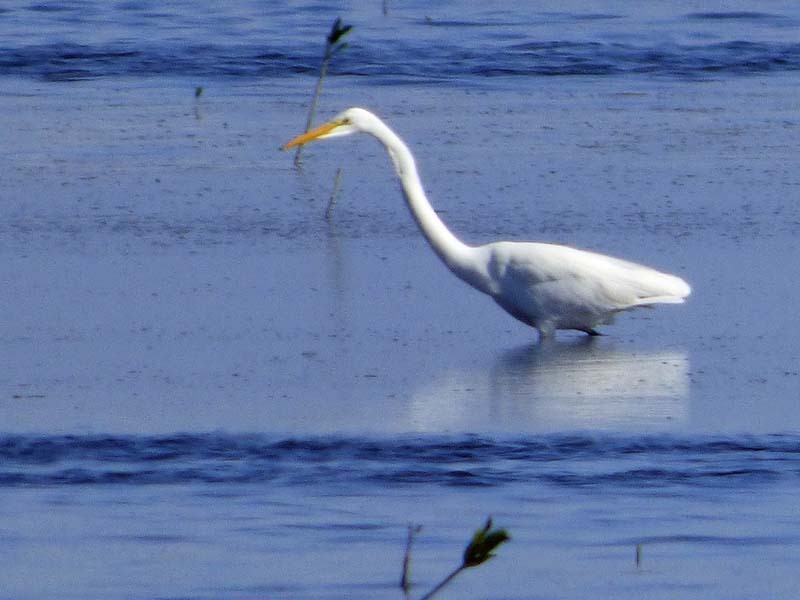 The tide was fairly low and half-a-dozen or so egrets were stalking fish on the shoal (actually a mud flat at low tide). This one caught a fish as the tern looked on from its perch. 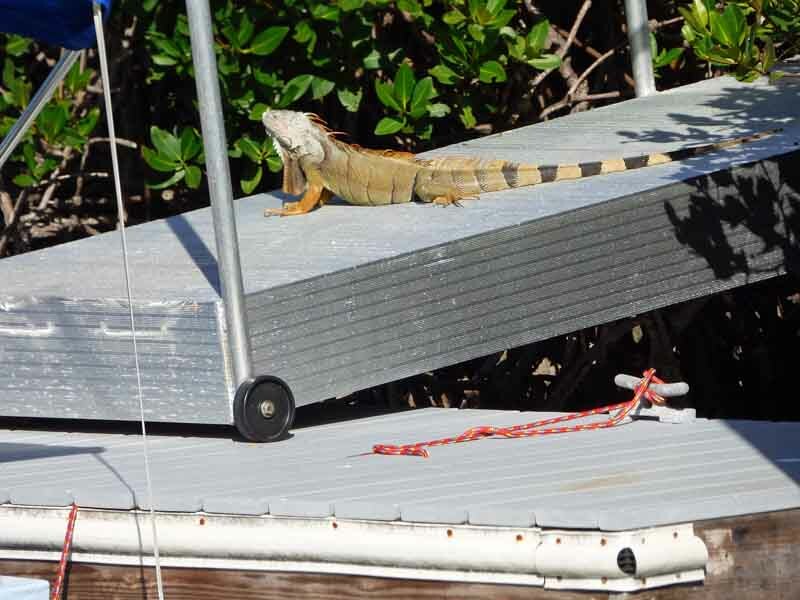 We spotted this huge iguana on the pier across the canal. It was several feet long. Here is a closer look at his handsome face. The weather is glorious, in the 70s these past few days, with blue skies and a nice breeze. 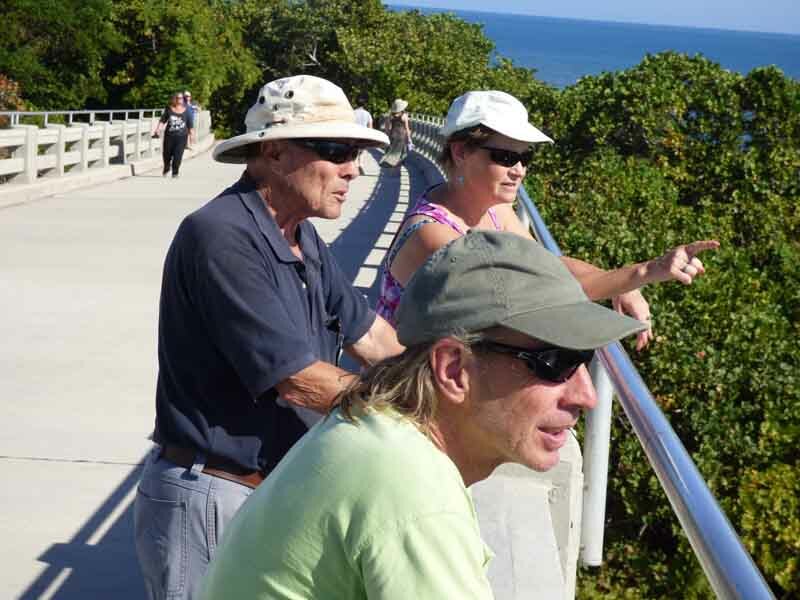 We invited RV park neighbors, Bill and Mary to go to Bahia Honda State Park with us as they had never been there. 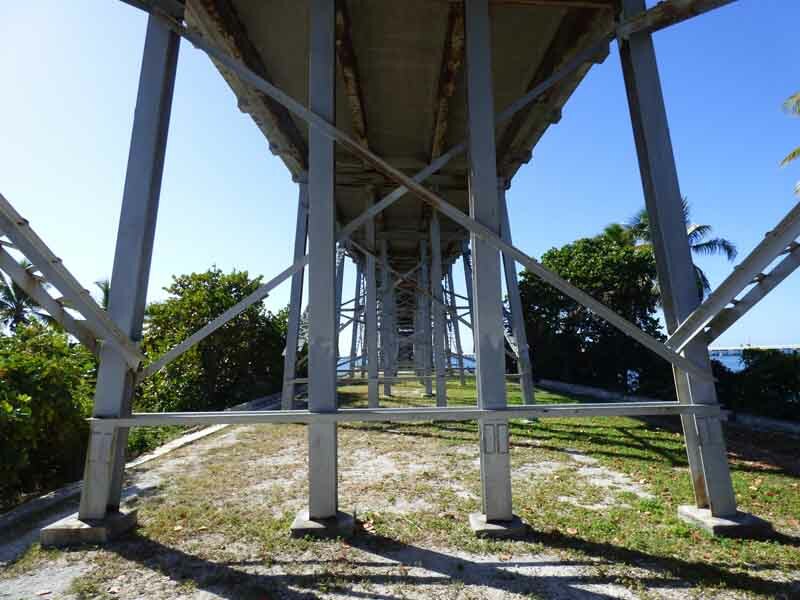 First, we took them to the Old Bahia Honda bridge for the view from the top. 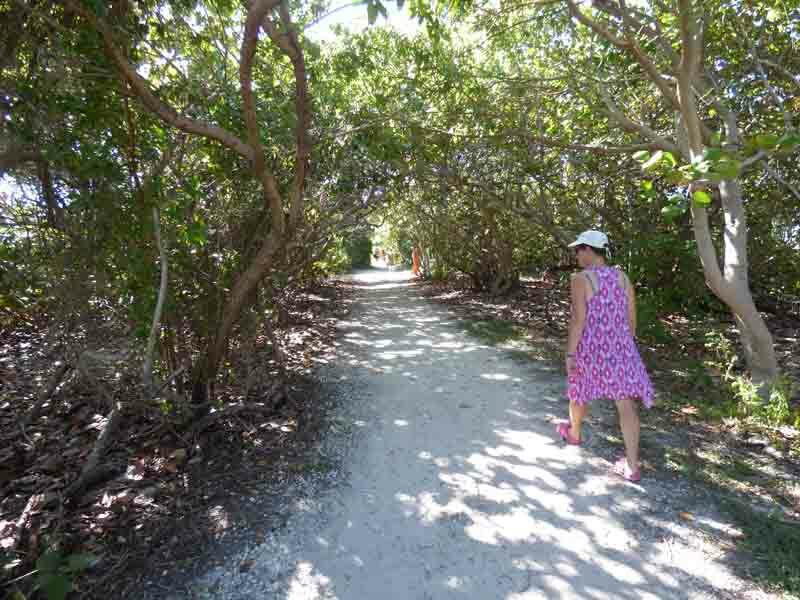 The path to the bridge is through a tunnel of Sea Grapes and is nice and shady. Mary led the way. The view from the top is nice. This is the gulf side. 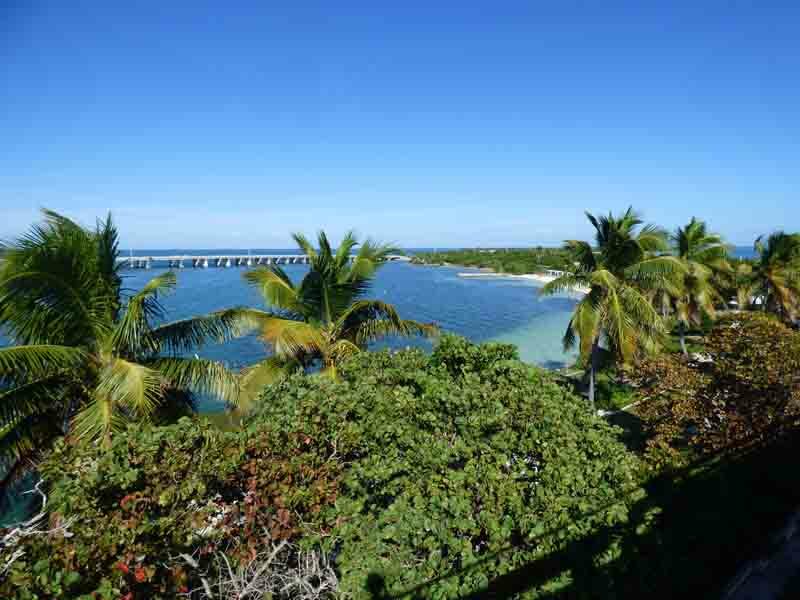 Mary spotted a nurse shark swimming close to the bridge on the ocean side. Then we walked beside the bridge on the ocean side and crossed underneath it. The breeze was nicer on the gulf side as we walked back to the car. We drove to the beach on the east end of the park. 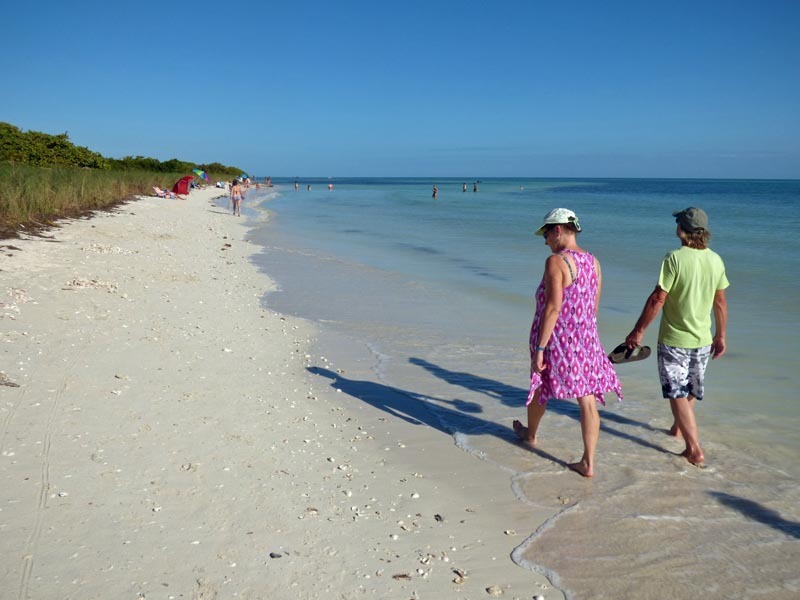 Then we walked up the beach to the far end of the island. 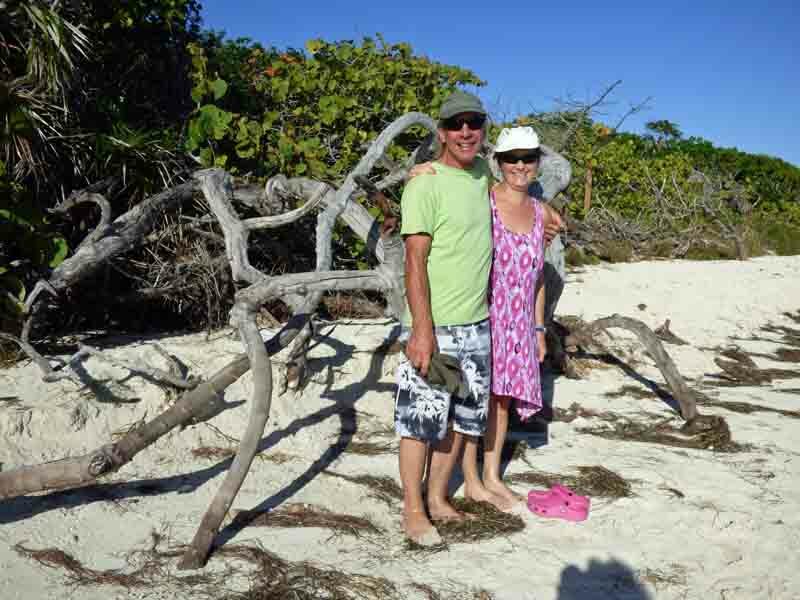 I asked Bill and Mary to pose for me next to some driftwood. 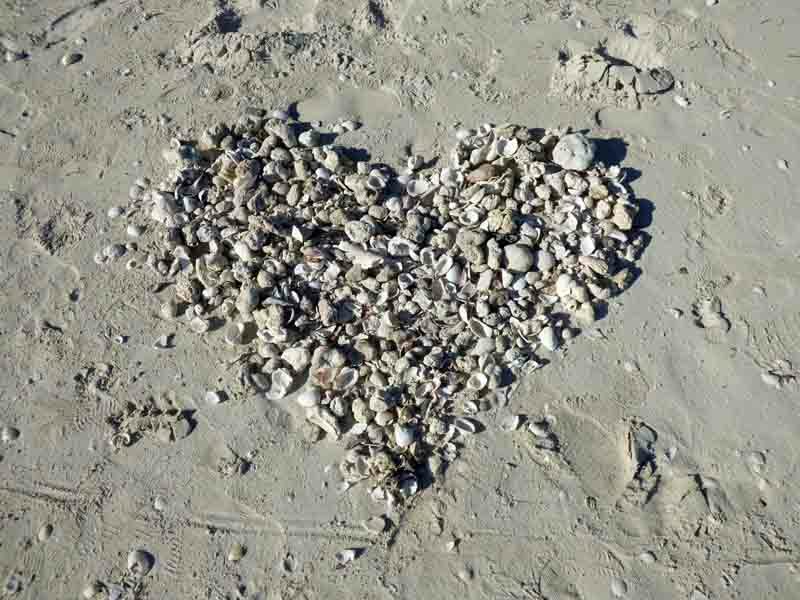 Someone had gathered enough shells to make a shell heart on the beach. It was two-feet wide. 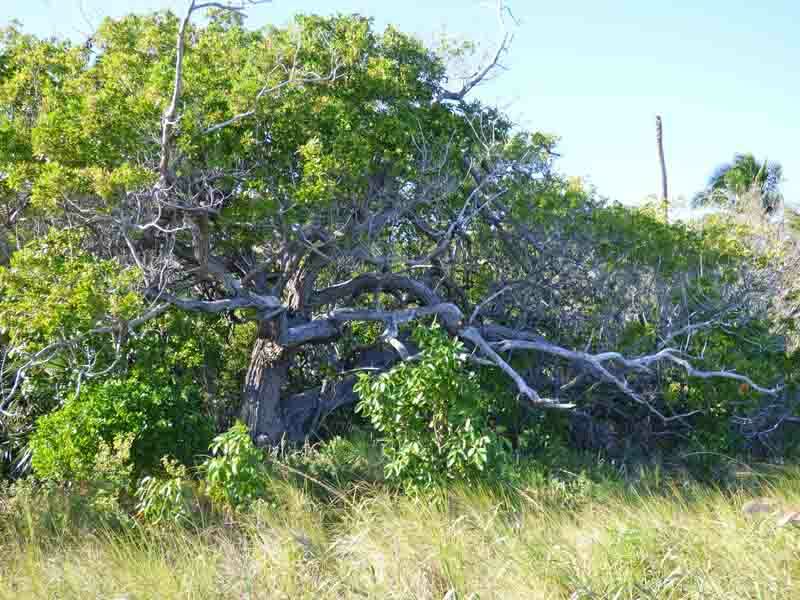 This great tree is at the east end of the beach. It doesn’t look too healthy. 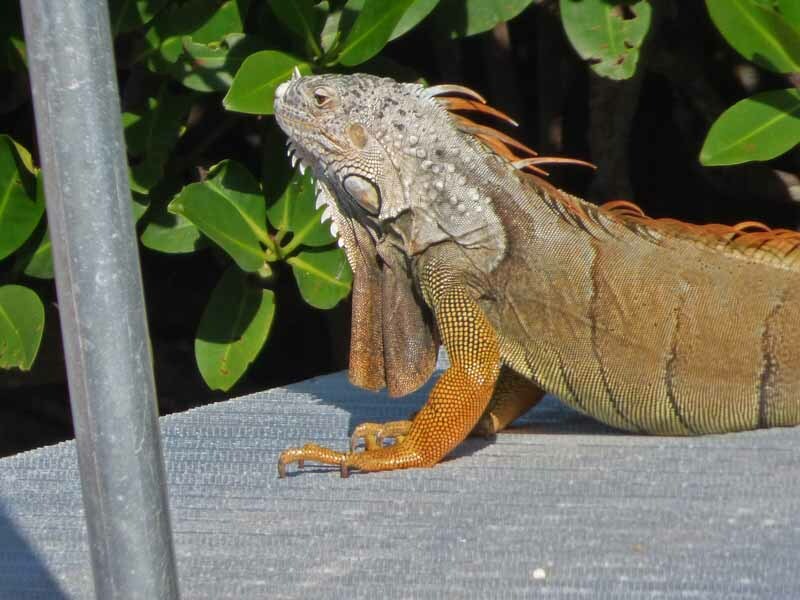 It has been a hectic few days getting settled into our RV site again. The RV itself was easy: park it, hook up the utilities. The rest has been work. We went to the UPS store to pick up our mail. There were three months worth of bank statements and a bag full of other assorted mail to go through. That took hours. The laundry hamper was overflowing. In the tiny RV washer/dryer, that meant one and a half days of washing and drying. Then I started reconciling financial statements. Sometimes I really wish that I was not a Quicken junkie. Andy has been doing the hard stuff outside. We have a small shed for the patio furniture and grill. He set up a small table and chairs out back by the mangroves so we would have a place to eat outside. Then he struggled to get the propane tank hooked up. He swept up a lot of debris from our “little slab of paradise”. He had to repair the push-broom to finish the job. I saw him messing with the bicycles too. All that only took three Band-Aids. He keeps Johnson & Johnson in business. Finally, in the late afternoon, we took a walk to the ocean to sit and relax. I had not realized how beautiful a day it was, inside, with my face in the computer screen, most of the day. Here’s another picture of the little lighthouse. 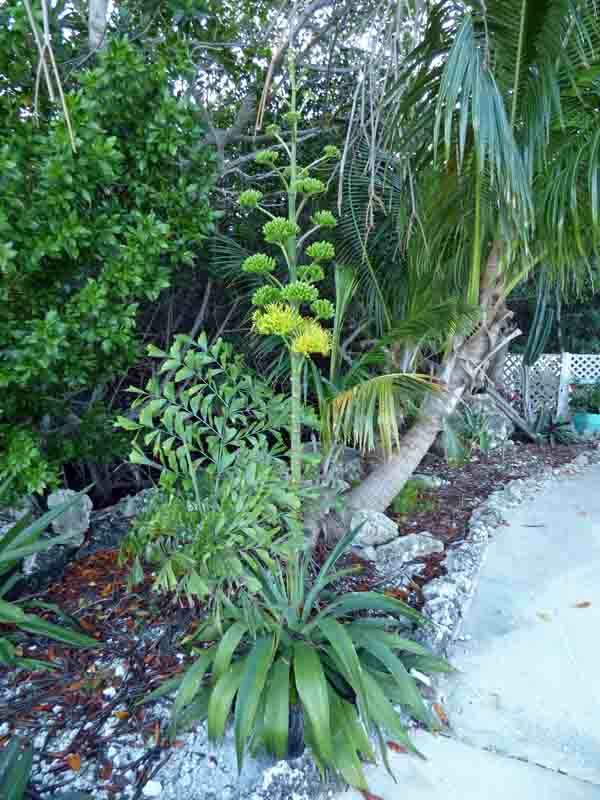 I noticed that the Century Plant is in bloom. Here is a closeup look at the bloom. There were at least a dozen more buds above the blooms. 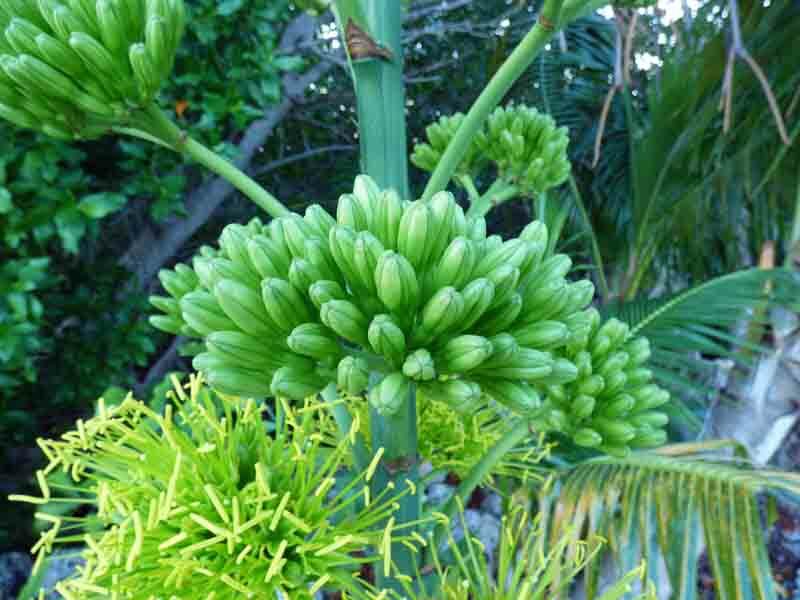 They are almost as cool as the bloom itself. Yes, it is good to be back home. We had a beautiful, easy travel day right up until we were almost home. We followed the Florida Turnpike all the way to Homestead. There was no traffic to speak of. I was the rolling roadblock on the turnpike. Everyone else just glided by and around us. 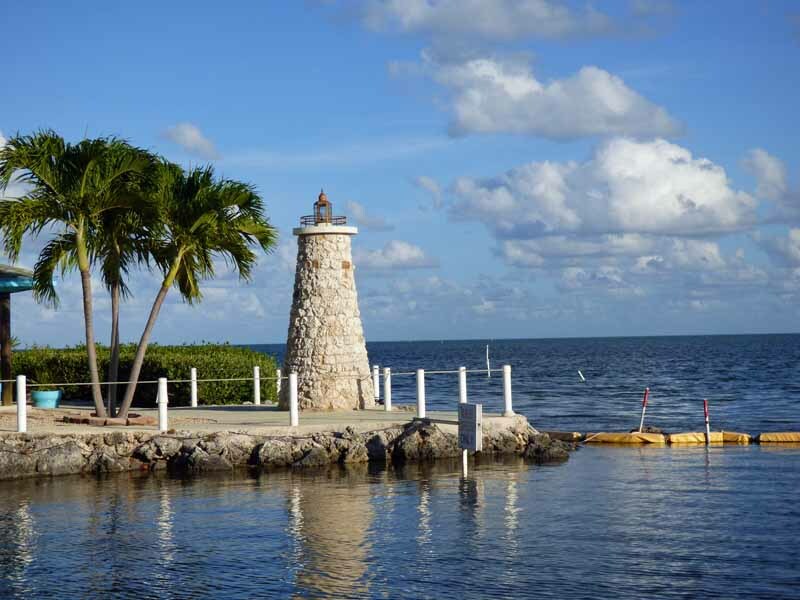 It was getting dark when we approached the 18-mile stretch over to Key Largo. That is when I realized that I did not have headlights, at least not very bright ones. There were no dash lights either, so I couldn’t tell how fast I was going. I turned on the emergency flashers to give folks a better chance of seeing this lumbering beast coming down the highway. The RV park neighbors all turned out to get us backed into our site. I could not see a thing in the rear-view mirrors or the backup camera and had to rely on instructions from five guys at the same time. And, they were not all yelling the same instructions. Things are a bit tighter on the lot than they were last year. Our neighbor, Dominique, set a small shed in the spot where we used to go around our power box on her lot. So we parked Sao closer to the center of our lot to give Andy room to walk between the motorhome and the power box on our lot. I hope we still have room to set up the screen room. 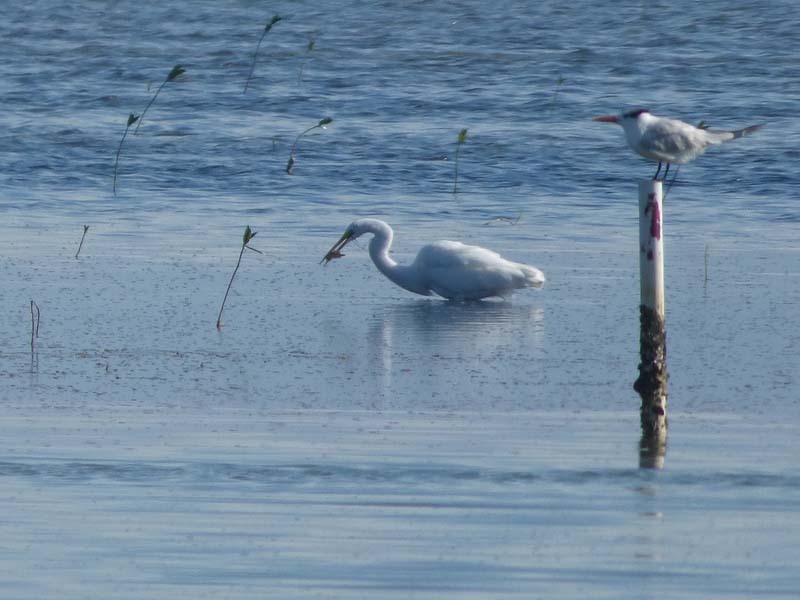 It is essential when the no-see-ums come out of the mangroves. I was happy to see that two of my coconuts sprouted over the summer. The papaya has gotten taller but did not bear fruit. 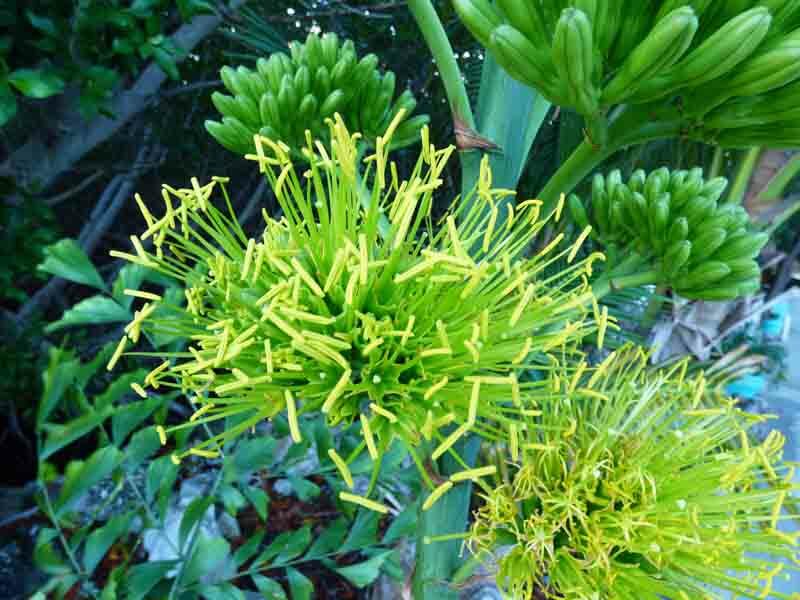 It is a male tree. I hoped it might be male and female. I’ll give it the winter and if it doesn’t bear fruit, I’m not going to waste any more expensive water on it. I guess the big news is that we decided to buy a house in the Arlington Ridge 55+ community in Leesburg, FL. I think I’ll like it just fine but am still stressed over making the decision. I mean, what is not to love there? Ten acres on a mountainside, part pasture and part forest? Actually, there were several things that made this impractical, all of which Andy calmly pointed out. Unfortunately, he was absolutely right. We looked around some more, but nothing else moved me. Then, while waiting here in Alliance Coach for a new window shade to arrive, we decided to look around in The Villages. This must be the epitome of retirement communities. It is huge. There are 55 golf courses and thousands upon thousands of homes. We probably looked at a dozen of them. The first day, Tana took us to half a dozen. They were lovely, just right, in fact. But, the more we looked, the more stressed I became. Too large, too small, too dark, too fancy, too ugly. Nothing was just right. After Tana dropped us off at the end of the day, we decided to run to the grocery store for some fruit for breakfast. I don’t know what preceded it, but I started crying right in the produce section. Andy was bewildered. The next time we looked at six more houses, a bit larger and more expensive. That night, my stomach growled and gurgled non-stop. I was so churned up. Then I realized that maybe I am not ready to settle down in a house yet. I don’t want to give up the nomadic lifestyle. I do want a house, though. I want counter space in the kitchen. I want a place to stow the vacuum cleaner. I want a place for the paperwork and files. I want to hang my artwork on some walls. I want a real dining room table on which to eat dinner. 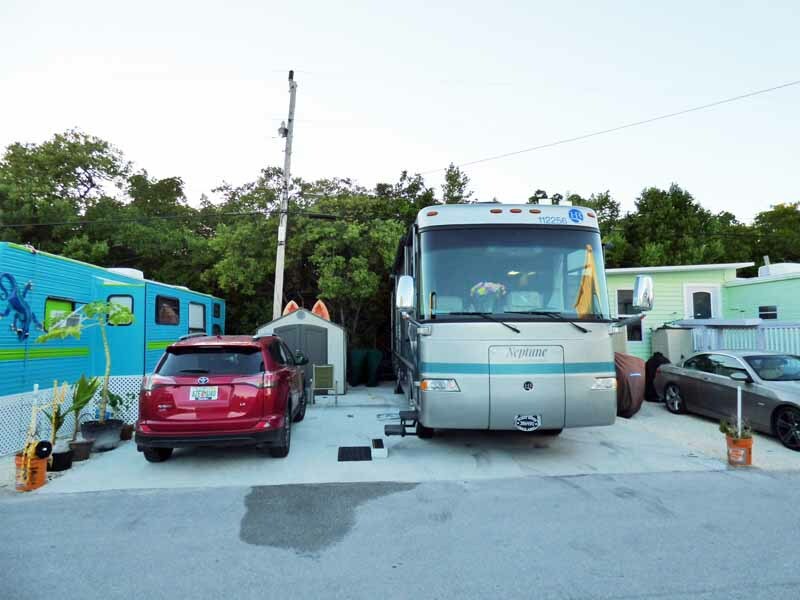 Our service advisor, Will, suggested that we look at Arlington Ridge, an active adult community, as they call them, in Williamsburg, Florida, not far away. It is nice. The houses are much less expensive too. There are probably hundreds, if not thousands of these communities in Florida. They have a golf course, swimming pool, and clubhouse, etc. This one has several floor plans that I like and within our price range. I think Florida homes all look alike. We are thinking about it. It is still stressful. Big decisions. Life changes. Aaarrgh!!! The long-awaited window shade finally arrived. It was the wrong one. 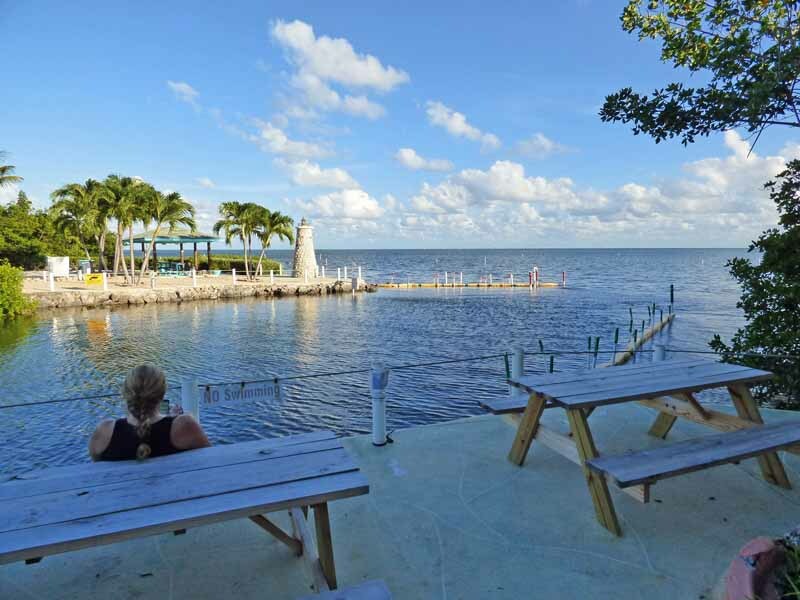 We decided to give up and head on down to the keys. Will said they will ship us the new shade when it comes in. So this is our last night in Wildwood. Now, rather than looking at houses, I can go back to being stressed over THE BOOK. The first concert this season is the Canadian Brass. We have another great season lined up so buy your season tickets now. If you prefer, you can buy tickets for individual performances. They are all great! We have seen Bill and Dawn several times since we got to Wildwood, but I have forgotten to take a picture every time, even though I had the camera with me. Here is Andy with Bill and Dawn at Crispers for lunch. We’ll see them again when we get to Marathon. Sao got her annual wash and wax job while we were out to lunch. I failed to capture the shine in this photograph. Everything looks good except those fading vinyl decals. I spotted this great cloud on our walk yesterday. It was a jet contrail, for sure, as it was all across the sky. I zoomed in on one section to show the great streamers being blown off the bottom. Looks kinda like a beard or, maybe, jellyfish tentacles. I don’t know why it is so hard to capture the Spanish Moss hanging from the Live Oaks trees, but I’ll keep trying. 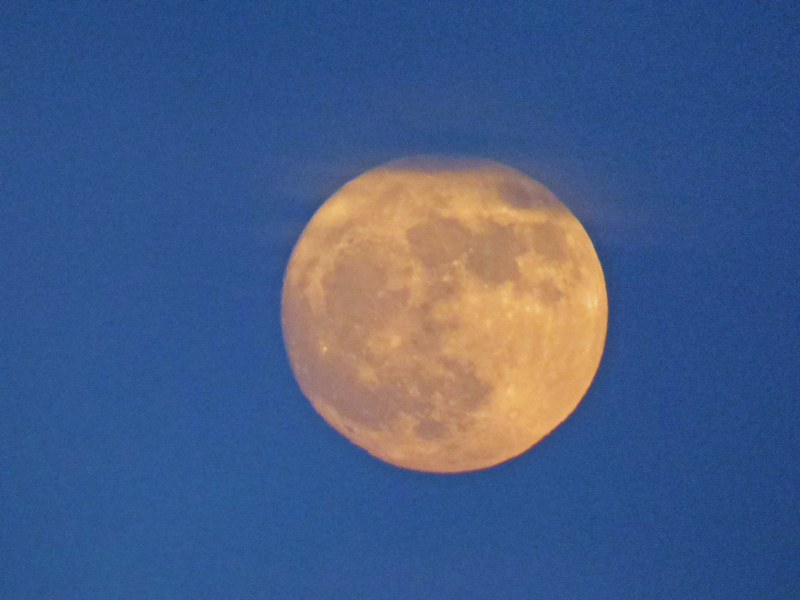 We had a brief view of the Super Moon this evening, but it disappeared into the clouds. Maybe we’ll get a better look tomorrow. You really can’t tell that it is bigger than normal just by looking up into the sky. It’s not THAT much bigger. Beautiful none the less. We spent most of the day house hunting with a local realtor. I like her a lot. I’m not so sure about The Villages. 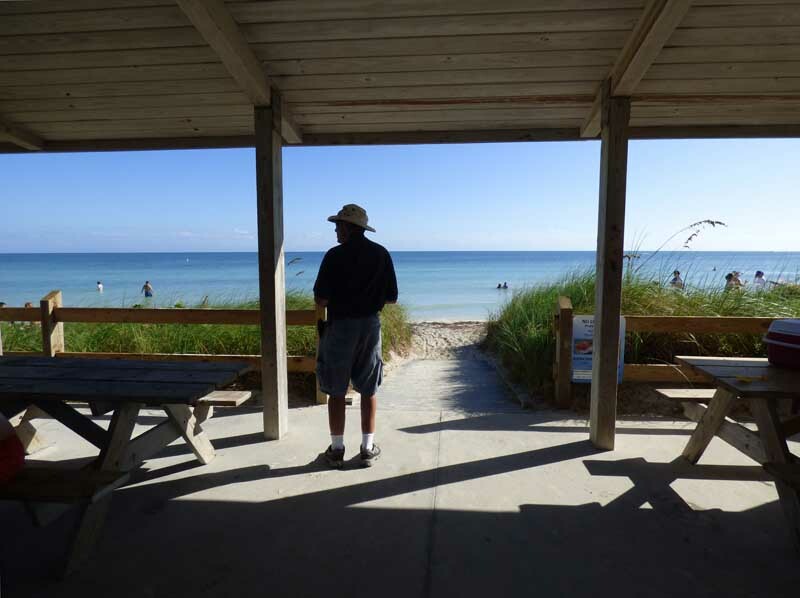 There are a lot of good reasons why retirees are flocking here from all over. The houses are nice, and there are many amenities for old folks, but the yards are so tiny. Some not even large enough for a nice patio for outdoor eating.